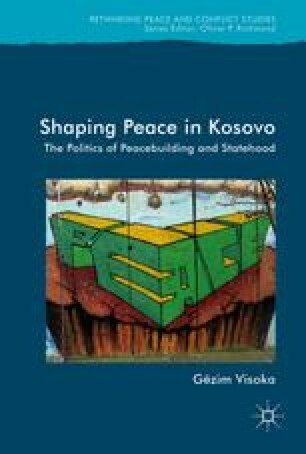 This concluding chapter offers a reappraisal and charts the necessary conditions for a more emancipatory form of peace to emerge in Kosovo. The proposed agenda for an emancipatory peace is situated in a delicate balance between the necessity for joint commitments to the state of Kosovo, dealing with the past through an emancipatory reconciliation process, and the promotion of people-centred security. The book concludes by asserting that grounds for emancipation in Kosovo are more likely to take place through self-emancipation and individual actions than organised and collective politics. Insight B (2013) Yugoslav Army General Admits Kosovo War Crimes, 28 January. Available at http://www.balkaninsight.com/en/article/yugoslav-army-general-admits-kosovo-crimes/1458/74 (accessed 27 June 2016). Wolff S (2002) Beyond Ethnic Politics in Central and Eastern Europe. Journal of Ethnopolitics and Minority Issues in Europe, 4. Available at http://www.ecmi.de/fileadmin/downloads/publications/JEMIE/2002/nr4/Focus4-2002_Wolff_Kymlicka.pdf (accessed 31 July 2016).